When people accuse this ऐनीमे of being full of "fanservice", does that just mean the characters' bodies reach a certain ideal? How did आप discover "Free!"? Which Free! character are आप most like? Over the last weekend my friend and I attended a con in California where we hosted an 18 and over panel themed around Splash Free! Even though it was the last panel of the last day, the room was full and everyone had a blast. 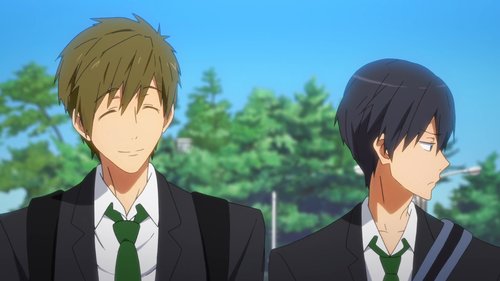 Haru and Makoto hosted several activities including a speed drawing contest, a dating game, and an improv dance battle. The audience interaction made the event so fun. The 12th and final scheduled episode of the Free! - Iwatobi Swim Club टेलीविज़न ऐनीमे ended early Thursday morning with a message that simply read, "see आप अगला summer…" The पूर्व episodes ended with the message "see आप अगला water time," but Kyoto एनीमेशन has yet to announce a सेकंड season of the anime. From how long Haruka and Makoto know each other? Who is your प्रिय character and why?